Kiteboarding kite size. What size kite should I get? How can I use this kiteboarding calculator? The kiteboarding calculator will help you to estimate which kiteboarding kite and kiteboard size you should use in chosen wind conditions. It can also work the other way round - type the kiteboarding kite size you have, and the optimal wind speed with maximum-minimum range will appear. The kiteboarding calculator is based on the formulas from kitesurfing spreadsheet by J. Douglass. The values above relate to regular kites. The trainer kites are much smaller, but they are recommended not only for the beginners. They can help to develop your kite skills and kite controlling, they are great for crashing, and the most important - kiteboarding trainer kites are really fun! 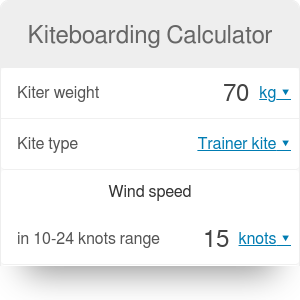 You can choose the trainer kite option in our kiteboarding calculator to check what's the best kite size for you. Weight of kiteboarder - the most basic parameter, used as a reference point. Average wind strength - general rule is: the harder the wind is, the smaller the board can be. Preferred style of riding - for advanced high flying, fast riding kiteboarding, you can think of choosing smaller boards than coming from the equations. Overall board shape - the board size will differ with the rocker (bottom curvature), width (usually in 40-43 cm range) and outline (profiling shape of the board). Start from typing your weight. Remember that you can always change the units - simply click on the unit displayed and select the one you prefer from a drop-down list. Suppose your weight is 180 lbs (~ 82 kg). Choose the kite type. The trainer kites are a good way to get started off with the kiteboarding, so let's select that option. The board sizes for beginners appeared already! It's 69.5 in length, 18.4 in width. Continue typing the values. As you have no idea what size of the kite should be, estimate the speed in which you expect to kiteboard. Enter the speed into Ideal speed box. Assume it's 15 knots. Hey! You found the perfect trainer kite size! It's 2.8 m². Are you curious how many calories you burned during average kitesurfing activity? Check our calories burned calculator. Kiteboarding Calculator can be embedded on your website to enrich the content you wrote and make it easier for your visitors to understand your message.